Hi all! Sorry I'm a day late with this, but the sort functions are in! The "sort" button in the default persona window is 2 buttons here - name and level, so you can pick which you want the bags sorted by. The bags now have a "Bag Options" button in the header bar. Please note: it uses the same graphic as the Window Settings button in the default UI, but it does open the bag options! The default bag options button just could not shrink sufficiently to fit without looking very, very weird. I also only recently realized that when I borrowed Drum's editable notes for the examine window, I didn't include an ignorelist file, so eq2maps has been breaking the UI. That's added now as well, and my sincere apologies to everyone! Breath and casting windows with unique graphics. Target and Implied Target windows have the threat meter embedded! Target window also has buttons to swap between simple and detailed con view, to assist target (assist button is under threat indicator), and to look up the target on EQ2i and Zam. Quick-change window accessed via Video button on xp bar. Includes video quality quick-change buttons (plus three shadow option buttons), volume change buttons or sliders, and toggles for illusion visibility, in-game browser, helm visibility, and hood visibility. ThorUI custom windows have been named as such, so editing the eq2ui_journals.xml/eq2ui_mainhud_xml files is no longer necessary when SoE adds new windows. A summary of the customizations is included in the .zip file. Enjoy! 20130227 - updated persona and bag windows for sorting, added ignorelist for eq2maps. 20120730 - added new tab to character window, fix to currency tab and to group window, incorporated previous patch. 20120616 - fixed in-game browser, incorporated previous patches, added quest update indicator to target window. 20111206 - hideable beastlord bar with weakness indicator, updated persona window (but only one now), updated pet window, minor updates to tradeskill and merchant windows. 20110222 - Destiny of Velious release! Persona, pet, and quest journal windows have added functionality, and tradeskill window has a version update. 20101208 - Corrected issue with tab's overlapping in knowledge window. 20101012a - Tweak to the persona window, and put the new trade window in. 20101012 - Update for GU 58, with updated persona and target windows, and the new game-supported click-to-cure on player, group, and raid windows. 20100929 - Bug fixes and option tweaks; clock is corrected, inventory screen has buttons for stats instead of drop menu, xp bar does now have the disable xp options, and quickchange window has an option for volume buttons instead of sliders. 20100820 - Update for GU 57, with redone xp bar, persona/inventory window, and several now-defunct windows dropped or repurposed. 20100525 - Updated quest journal for storyline option, corrected xp bar display error, updated knowledgesort window, added a layout option. 20100216 - Updated quest journal and active quest window to work with Sentinel's Fate. New graphics settings options from Zenubi. 20090927 - Put in the correct version of the quest journal, and removed a file that wasn't supposed to be included. Yes, I am fail. 20090925 - More graphics settings fine-tuning by Zenubi. Lookup buttons for EQ2i and Zam added to the quest journal and target window. AA indicator added to the target and implied target windows. Background on target/implied windows hard-coded to transparent. 20090620 - Zenubi was kind enough to send me various windows I didn't have, and correct some that weren't working for him like they were supposed to. Also, for some bizarre reason the Start Button disappeared with GU 52, corrected that. thanks for your great job. However, I got a problem, the compas is not displayed, whereas everything else is working properly. Could you help, please? Actually, what I'm looking for is a dynamic loc addon, is there a way to get only this kind of addon? Last edited by demonatika : 12-13-2013 at 03:46 AM. The persona window is broken with the latest expansion release Tears of Veeshan. There may be more broken things, but this is the one that I noticed. Last edited by thepriz : 11-17-2013 at 05:10 AM. Your update was most wonderful. As you probably know, they changed tooltips again earlier today and it is broken in the UI again. HELP! Just finished the fix, patch going up now! I am still working on it, but I haven't been able to fully test the tradeskill window yet. I was hoping to get it tested and release a full update all at once, but my game time's been far less than I'd like for the past two months. I think I know what's up with the tooltips. Will try to get that edited and tested later today. Alternately, watch Drum's for an update - the problem is in the examine window, and I'm using his (with his permission). Once I get that fixed, I'll go ahead and post a full UI update, with the caveat that the tradeskill window may need tweaking for experimentation. As long as I'm posting update info, I'll say now the group window will not be updated for SOEmote for a while - I have neither a webcam nor a computer with enough power to put one more strain on it while running EQ2. I expect those to change by new year's, but even after that the slim versions of the group window won't have it. It sort of defeats the purpose of a slim window to have bulky graphics options attached. With recent weekly updates and the release of CoE, parts of the UI have stopped working and I have been replacing them a piece at a time (i.e. crafting was the last piece I replaced). Todays hotfix made tooltips non-functional and I don't see a way to replace that feature without changing UIs. Is this UI still being maintained? No new comp, but a repair install and some other tweaks seem to have helped immensely. Only one bluescreen since FanFaire! [s]Okay folks, sorta bad news. Thor's going on hiatus for a bit. I'm bluescreening in EQ2. It's not every time, but it's often enough that it worries me and interferes with testing UI pieces. So cutting game time to a minimum, and what time I do get on will probably not be spent on updates. I do have plans to buy a new computer this year, but it won't be until after FanFaire at the earliest. Hopefully it'll be very soon after FanFaire, and before the next GU. I'm sorry I didn't get the UI changes for GU 60 complete. Last edited by Lodrelhai : 08-23-2011 at 05:55 AM. Hopefully the downtime due to the hack hasn't chased you from the game like it has done for a few others I know. I really like this UI and appreciate to work you are doing to keep it current. 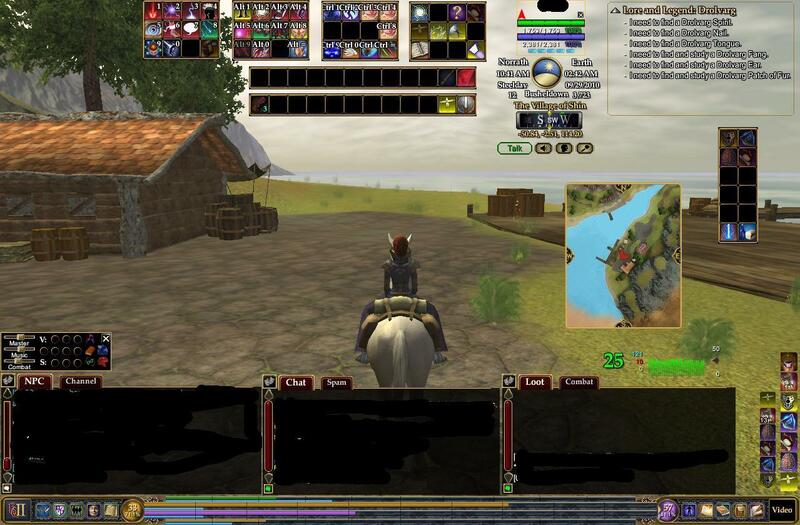 If you've decided to stop maintaining the UI, thanks for your past work ... do you have a suggestion on a UI replacement that it similar to this one? Downtime didn't chase me off, no fear! I've been futzing with options and missed how close we were to GU60 . I'm going to post a functional persona window and Zenubi's latest graphics options as a patch, since those are ready. My apologies to anyone who uses this UI and plays pvp, the xp bar is my next priority! And if I don't have the other options I've been working on useable by this weekend, I'll post the full UI and leave the optional stuff to next GU. Just want to let everyone know, I'm out of town until Sunday, and my laptop does not run EQ2. So I can't make or update any needed UI changes until I get back. Expect any needed updates after May 1st (hopefully very soon after). Sorry for the inconvenience. I honestly didn't expect the housing changes to be pushed to live until the next GU! I have always loved the the thor ui clock, but awhile ago it quit working with my other ui i use. Which files and image file do i need now to get it to work again? I'm sorry it's taken so long for me to get back to you on this. But I need to ask, what part of it is not working? For the clock itself to display, you shouldn't need anything more than the eq2ui_mainhud_clock.xml file from ThorUI. Several people reported a while ago that the graphic wasn't working, which turned out to be a change of reference I hadn't caught. If the problem is the graphic not showing, check if the other UI you use has a custom graphic file in the images folder called specialelements.dds. It could be that the other UI uses a different graphics reference for clocks, in which case you'd need to find its clock graphics and change the references in the ui file. If none of this fixes it, let me know. just wondering if there is a way to disable the timer graphic for harvesting/casting whatever. I like the plain jane progress bar but can't figure out how to get it back. 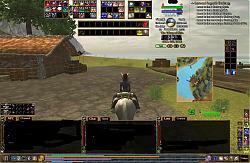 Just remove the file eq2ui_mainhud_casting.xml from the EverQuest II/UI/thorui folder. You'll have the normal casting bar again next time you load the game. No included auto-attack bar, sorry. I use samejima's personally, but there's others in the downloads/miscellaneous section of EQ2Interface.